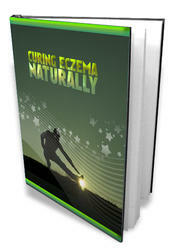 • A mainstay of modern diabetes management is the "activated" patient, who is educated and prepared and involved in care. Over the last several years, there has been increasing evidence of the effectiveness of the "chronic care model" as developed by Wagner (1998). 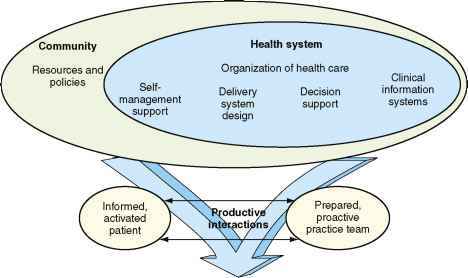 The essential elements of the model are divided into the community (resources and policies), health system (self-management support, delivery system design, decision support, clinical information systems), an informed activated patient, and a prepared proactive practice team (Fig. 34-2). Of note, community programs and organizations are often acknowledged but may not be used in a busy practice. Self-management support involves not only providing instructions but also facilitating the patient's acceptance of control over DM. The delivery system design means clarifying roles and responsibilities, as well as ensuring that the right care is delivered, with up-to-date information about the patient and appropriate follow-up. Currently, decisions need to be supported by evidence-based medicine and guidelines, and patients monitored for ongoing care and response. This approach should lead to a patient who is the true locus of control and a practice in which all the professionals and staff provide current and responsive care to their patients. The essential skills needed by the family physician are working in teams and facilitating teamwork in the office setting. A 2004 Cochrane review found that a multifaceted approach can enhance management of patients with diabetes, such as regular prompted recall and review of patients and patient-oriented interventions, along with proactive, involved nursing. Other models, such as stages of readiness for change, have led to more effective counseling and intervention strategies. Studies have shown that without an organized approach, using the current system of care will not succeed in adequately controlling diabetes, and that simply introducing diabetic flow sheets or the concept of nonphysician personnel interacting with diabetic patients is not enough to change outcomes. Following guidelines, measuring performance, and working to improve the clinical practice are hallmarks of the modern family physician's approach to diabetes management (see Web Resources; Physician Consortium). psychopathology. A the extreme, eating disorders or severe depression can cause marked variations in the intake of essential nutrients, leading to either the dangers of hypoglycemia or the initiation of DKA. This is true among adults with diabetes as well as adolescents. Not surprisingly, therefore, diabetes has been associated with depression, at least in a Caucasian population, and as expected, those with such "dual diagnoses" tend to have more emergency room visits and inpatient hospitalizations. Parents of a child with diabetes are less depressed or distressed than parents of a child diagnosed with cancer. Over time, however, parents of diabetic children can become more distressed, including their sense of control, self-esteem, and disease-related fears. If a family cannot be appropriately supportive, regardless of the patient's psychological state, the locus of control may need to be switched from the patient-family to the patient-physician relationship. Endotext; up-to-date, comprehensive source of information on all topics in clinical endocrinology. cardiovascular complications, and higher mortality, but also that these patients struggle with multiple barriers to adequate care. Access to any care is a perennial problem in many populations, so that for a chronic disease such as diabetes, which requires multiple visits and interventions, the automatic disparity in access leads to significant differences in outcome. In addition, cultural belief systems that lead to the use of alternative healers, distrust of traditional medicines, and misunderstanding of the disease process also serve as barriers to care. Given the complex interchange among culture, diet, body image, illness behavior, and the dynamics of race and gender, a family physician caring for a patient with diabetes must overcome not only the pathophysiology of the disorder but also these diverse barriers to care. The task is difficult, but diabetes control can be achieved when an "activated" patient and the physician confront these challenges together.